NEW YORK -- Harken back to when Shake Shack was not a burger-flipping force in more than 130 locations around the globe. If you're looking for culinary secrets, forget about it. The recipe for ShackSauce, for instance? 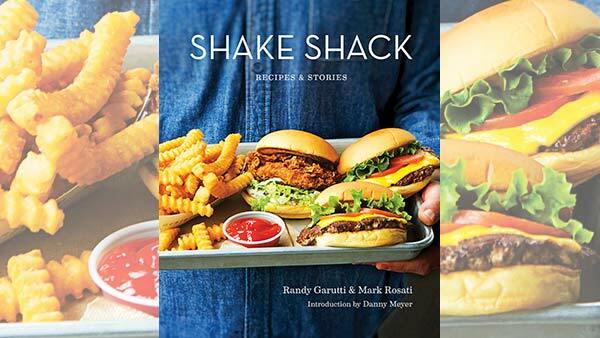 Rosati, in an interview with The Associated Press, wasn't giving it up, but the book gets Shack fanatics close with another recipe. It's a fun read, part Shack kitsch and part, if you must have crinkle fries, here's how to make some. Rosati started as a line cook at Meyer's Gramercy Tavern before heading for the Shake Shack in Madison Square Park that replaced the cart. "I didn't want to go. I thought it would destroy my career," he said. "I was going from fine dining, cooking with white truffles and foie gras, to flipping burgers? Then I saw all the same ingredients we were using at Gramercy. The same beef, the same produce and the same hospitality our company is known for. So I thought, I'll do this for a year. Fast forward 10 years." AP: Tell us how to think like a burger maker? Does kale ever belong on a burger? Why can't you get a burger rare at Shake Shack? Rosati: It comes down to you need to find the finest ingredients possible if you're going to make a really stellar burger. And kale, yeah, it can work in the right context. Maybe if it's in the summertime and you throw the kale on the griddle and it gets a little smoky and crispy, toss in some olive oil, maybe some garlic, maybe a little Parmesan cheese and put that on top of a burger. That's going to be pretty good. We feel the best experience is in the burgers cooked medium. We want those juices to be a little runny and drippy. That's where the pleasure factor is. You need to use the whole muscle, or the steak, because that's where all the flavor is. If you take the trimmings, which most butchers do, they don't have the flavor. That's the real secret. AP: What's your favorite burger? Rosati: It's probably our SmokeShack burger. It's very personal why I love that burger. It was the first burger we ever added to the menu since the inception of Shake Shack. We wanted to add a bacon burger and we knew it would be too easy just to add bacon. We wanted to do a burger based around the flavors and textures of bacon. I thought about chopped and pickled cherry peppers. I grew up in an Italian household. My parents would cook a pork chop and put cherry peppers in the pan. The cherry peppers brought acidity and heat, which cut through the richness of an otherwise rich meat. So it's a cheeseburger with ShackSauce, which is a mayo-based sauce, with bacon on a buttered bun. That's a lot rich flavors and textures, so I thought about the cherry peppers. Rosati: It's us going out and trying to source the absolute finest food, for not only our core menu, our ShackBurger, our fries, but also when we open a new city, it's the same thing. We look at going to a city like Los Angeles and we reach out to a lot of our fine dining friends, be it chocolate makers, be it bakers, that we admire and we bring in that talent. When we opened in LA, I've always loved this jam maker called Sqirl. We blend their jam into our frozen custard for one shack in one city. It's one of our frozen Concretes called the Rainbow Connection with the strawberry jam from that chef, Jessica Koslow. And another friend who I consider one of the best bakers in all of Los Angeles makes us an old fashioned spice doughnut, then we add sprinkles to it. You can only get it at our West Hollywood location. AP: What can you do about the lines? They're crazy. Rosati: It's funny because I used to wait in that line in Madison Square Park. It's only three blocks from Gramercy Tavern and that's where I was working. I would go there early, wait in line for about an hour on a hot summer day, get my food and run back to the kitchen at Gramercy. My colleagues would come in and ask me to share and I was like hey man, I'm the one who put the time in there. You go and put your own time in and get your own burgers. At the end of the day, the line is the line. We can't do anything to stop people from wanting to wait in line. The time you wait between ordering and when you pick up your food, that's on us. We know couples who started in that line, started chatting, exchanged numbers, went out on dates. The next thing you know they're married and asked us to cater their weddings. It's just so surreal.